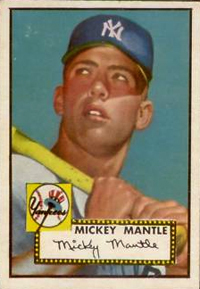 Mark Davis, a baseball card collector from Sonora, California was sitting at his computer on September 16th redeeming a stack of Topps Million Card Giveaway code cards when the screen unveiled one of the most coveted cards in trading card history, that card, a 1952 Topps Mickey Mantle. Davis, a collector of both vintage and new baseball cards unlocked one of three 52' Mantle's given away in the 2010 Topps Baseball Million Card Giveaway promotion. Million Card Giveaway code cards are seeded at a rate of 1 in every 6 packs in both series 1 & 2 of 2010 Topps Baseball.